Built in 1926 by architect, C. Freira, from Havana, Cuba. 18-foot-high ceilings, hand-painted ornate floor tiles, Tuscan columns, classical porch, and a balustraded roof. All construction materials were imported from Cuba. Originally built as the Cuban Consulate for Miami for Cuban Consul, Domingo J. Milord. Milord named the mansion in his wife Paula Milord's honor. The City of Miami officially designated the structure historic in 1983. Construido en 1926 por el arquitecto, C. Freira, de La Habana, Cuba. Estilo neoclásico popular en Cuba en la década de 1920. Techos de 18 pies de alto, baldosas adornado pintados a mano, columnas toscanas, porche clásica, y una azotea con balaustrada. Todos los materiales de construcción fueron importados de Cuba. Originalmente construido como el Consulado Cubano de Miami por el Cónsul de Cuba, Domingo J. Milord. Milord nombrada la mansión en honor de su esposa Paula Milord. La Ciudad de Miami designó oficialmente la estructura histórica en 1983. Video clip of Paranormal Research & Investigative Studies Miami (PRISM) on WSVN-TV Fox channel 7 news Miami with reporter Nicole Linsalata talking about the haunted Villa Paula mansion in the Little Haiti district of Miami, Florida on July 22, 2015. Read the news article here. Video de PRISM en WSVN-TV Fox canal 7 noticias Miami con la reportera Nicole Linsalata hablando de la mansión embrujada Villa Paula en el barrio de la Pequeña Haití de Miami, Florida el 22 de julio de 2015. Lea el reportaje aquí. The following electronic voice phenomena (EVP) was recorded on a full-spectrum modified GoPro Hero 3 in a small bedroom across from the kitchen in the Villa Paula (Miami, Florida) on July 9, 2015 by PRISM investigator Eric Vanderlaan. The EVP sounds like a male voice shouting something. In reverse, it sounds like, "okay". Este psicofonía (EVP) se grabo en un GoPro Hero 3 en la pequeña habitación al otro lado de la cocina de la Villa Paula (Miami, Florida) el 09 de julio 2015. Grabado por el investigador Eric Vanderlaan de PRISM. Suena como una voz masculina gritando algo. A la inversa, suena como, "okay" ("bien"). Un video de nuestra investigación de Villa Paula en Miami, Florida.PRISM con psíquico Argentino, Cristian Latina, y reportero Yoandy Castaneda Lorenzo de America TeVe, el 09 Julio 2015. Después que Eric recibir un par de picos electromagnéticos de alta frecuencia en el MEL meter, Cristian detecta la presencia del cuerpo de un niño enterrado en el patio trasero de Villa Paula. ¿Hay un cuerpo enterrado en el fondo de Villa Paula? En este video - psíquico Argentino, Cristian Latina; Investigador de PRISM, Eric Vanderlaan; Reportero de América TeVe, Yoandy Castaneda Lorenzo. Comenzamos la sesión utilizando el PSB-7 "Spirit Box", un instrumento que utiliza un escaneo de radio para comunicar con los espíritus. Instrumental TransCommunication (ITC) y psicofonía (EVP) se consideran como parte de la mediumnidad física, como las acciones del espíritu también afectan a los objetos, el equipo. Por otra parte, podemos notar estos efectos físicos. Podría Villa Paula realmente ser embrujada? Alrededor de las 20:30, el 07 de julio 2015, en la investigación paranormal de PRISM de la mansión Villa Paula, un par de eventos inexplicables ocurrió en el pequeño cuarto de baño. Inmediatamente después de la entrevista con América TeVe entre Yoandy Castaneda Lorenzo, Cristian Latina, y David Pierce Rodríguez, un psicofonía (EVP) puede ser escuchado. El término psicofonía está compuesto de las partículas "psique" y "fonos", haciendo referencia a un sonido producido por energía psíquica. Cuatro minutos más tarde, nuestra luz de vídeo se vuelve inexplicablemente fuera. Esta es la misma habitación que Argentina psíquica Cristian Latina sintió la presencia de una joven niña cubierta de sangre. 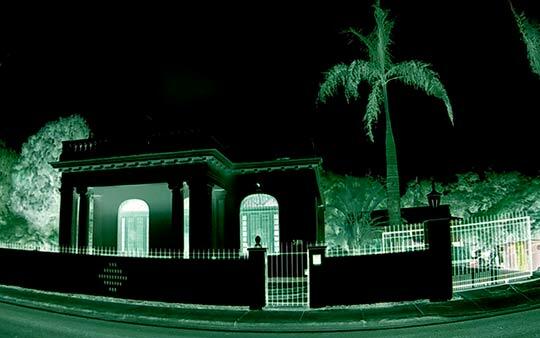 Villa Paula - Could the future Cuban embassy be haunted? PRISM founder David Pierce Rodriguez appeared on the Latin American talk show Arrebatados with María Laria and Yoandy Castaneda Lorenzo (América TeVé) on July 6, 2015. The topic of the show was what is reputed to be Miami's most haunted home, Villa Paula. The mansion used to be the Cuban Consulate and is located in the Little Haiti district of Miami. Villa Paula ¿Casa embrujada para embajada cubana? El fundador de PRISM, David Pierce Rodríguez, aparecierio en la programa en vivo Arrebatados con María Laria (América TeVé) en Miami, Florida, el 6 de julio de 2015. El tema de la programa era Villa Paula en Miami, Florida. Early 1930's - Muriel Reardon - Due to the Great Depression, the consulate was closed and Villa Paula was sold to Muriel Reardon, who lived there for around 30 years until her death in 1960. 1960's - Villa Paula changed hands several times during the next 14 years, serving as a senior citizen home for a period of time. Early 1970's - the building fell into disuse and became occupied by squatters and homeless. 1974 - Wilmer C. Ensor (a.k.a. Cliff Ensor) who restored the interior, eventually returning Villa Paula to a condition close to its former look. 1985 - Larry Cozart, a postal clerk, bought the mansion for $110,000 at auction. When he learned of the haunting, he immediately backed out of the deal. 1987 - Dr. Lucien Albert, a Haitian pediatrician skeptical of the supernatural. Sold Villa Paula in 2003. 2003 - Villa Paula Restoration Group, LLC - Marc Swedroe bought the mansion for $275,000. A lawsuit filed by Swedroe’s former business associate Martin Siskind alleges that the partnership with Marc Swedroe and his family was improperly dissolved. Paula Milord - Died due to complications of a leg amputation. She did not die in Villa Paula, but she supposedly haunts the mansion. Records she that was buried at the Woodlawn Park North cemetery in Miami, Florida. Most people believe that she is buried in the back yard of the mansion, underneath a large tree. Muriel Reardon - Lived in the house for 30 years and died in the mansion. Many people reportedly ended their lives in the mansion while it was a senior citizens’ home in the 1960's. Multiple cats - Three former owners and area residents say that cats have been killed when mysteriously slammed shut in the front iron gate. Baby buried outside - Three psychics believe that an infant child is buried in the backyard of the Villa Paula. They believe it to be the aborted child of one of the Villa Paula servants. All 3 psychics pinpointed the exact same location and PRISM's EMF meters all spiked at the same area. The daughters of previous owner Muriel Reardon, said that when they lived there as children, there was one room that they were never allowed into. Their mother was terrified of the room. Former owner, Cliff Ensor, claimed to have smelled coffee brewing and the scent of fresh roses, two of Paula's favorites, when there was none. During a séance performed in the 1970s, a spirit allegedly told the group that she likes to put vases of roses out. Cliff Ensor claimed to have witnessed dishes and silverware, being thrown to the floor. He also claimed that one day, a chandelier inexplicably fell from the ceiling. Cliff Ensor claimed that the back gate would slam shut on windless days, and killed three of his cats. Cliff Ensor said that a University of Miami professor brought a self-proclaimed Satanist to the house once and pushed her into one of the rooms. She immediately began to choke as if she were being strangled. Rev. Emma Tandarich, from the Holy Spiritual Church of God of Opa Locka, Florida, used to hold séances in Villa Paula every two weeks. She couldn’t play the piano at all, but one day she channeled a spirit and began to play like a pro. It was recorded on three separate tape recorders by Cliff Ensor. During one séance, she channeled a stern spirit that screamed, "I don’t like cats in my house!" Rev. Emma Tandarich, claimed that five separate spirits haunted the house, including a young woman searching for the grave of her illegitimate baby, perhaps a servant who had lived in the house. Fashion designer Fernando Garcia, rented the house for a brief period. While Garcia was sitting at his desk, a windowpane fell out of its frame behind him. When he got up to investigate, a 40-pound chunk of plaster fell from the ceiling onto the spot where he had been sitting moments before. "If I hadn’t moved when I did, I would be dead!" Fernando Garcia would often hear thumping on the wooden ramp that leads up to the back door, as if someone were walking on it. The day after Fernando Garcia brought his cat to the house, she disappeared. A friend of Garcia, apparently sensitive to the spirit world, began to cry after entering the former maid’s quarter. "They used to beat the maid," the friend told him. A previous owner said he saw apparitions in the hallway and heard slamming doors. In 2008, a Villa Paula groundskeeper said, "Stuff is always moving around in here. I’ll put something in one spot and find it in another later." He also said that three bulbs in a bathroom light fixture began to flicker on and off in random order one night. In 2010, the League of Paranormal Investigators (LPI) research team investigated Villa Paula and recorded several electronic voice phenomena (EVP) audio clips. LPI paranormal investigators reported being touched and one investigator was even pushed into the locked room. During the investigation both cold and hot spots and unexplainable EMF spikes were reported. In 2012, the Paranormal Crossroads Investigations team investigated Villa Paula with America TeVe reporter Glenda Galan and witnessed several unexplainable EMF and electrostatic spikes and recorded several strange orbs on video. An EVP saying, "Get out!" was recorded in one of the rooms. It has been said by various owners of the house, including the present owners, that the locals refuse to use the sidewalk directly in front of the mansion. This is said to be out of respect for the property. On July 9, 2015, Paranormal Research and Investigative Studies Miami (PRISM) conducted a paranormal investigation of the house. They recorded EVP audio clips of both a female that claimed to be Paula and a very deep sounding male voice that said "I'll kill! ".